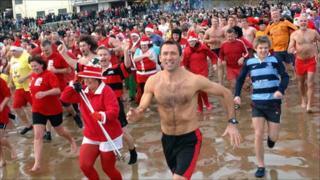 Hardy sea swimmers have taken the plunge into icy waters around Wales to shake off the Christmas cobwebs. Among those which hosted charity swims on Sunday were Tenby, Pembrokeshire, Llanystumdwy FC at Criccieth, Gwynedd, and Llandudno, Conwy. But the Walrus Dip at Cefn Sidan near Pembrey, Carmarthenshire, was cancelled earlier for the first time in its 24-year history because of icy roads. More than 600 swimmers turned out for the Christmas Day swim at Porthcawl. Porthcawl organisers estimated that between 2,000 - 3,000 spectators watched their charity event. The Porthcawl swim was in its 46th year, and among those who joined in was the mayor, Mary Emment-Lewis, as well as Victor Davies and Chris Hughes, who have each taken part more than 40 times. Swimmers ranged in age from children to one entrant aged 84, Ken James, of Ogmore Vale, while many were in fancy dress. Ian Stroud, of the swim committee, said: "Once again we have been grateful to all who supported our swim and the number of people that turned up was fantastic, considering the freezing conditions." His thermometer showed a temperature of -10C (14F) at 0900GMT on Christmas Day. But despite the conditions, he said the number of swimmers "far exceeded our expectations". Nicola Willis, who chairs the swim committee, said: "To have such a crowded beach, at this time of the year and in such harsh cold conditions goes to prove that some of our departed founder swimmers were looking down on us and provided us with very sunny conditions for a swim that saw more people in the water than we thought possible, considering the snow conditions that have lasted for more than a week now". There were cheers on the seafront at Llandudno as 42 hardy swimmers ran down a snow-covered slipway and into the water. Meanwhile, Tenby changed the name of this year's event to the Big Red Swim to mark its "ruby" anniversary, with the focus on fundraising for the Ty Hafan children's hospice. Tenby Sea Swimming Association chairman Chris Osborne said he was taking part for the first time in 20 years because it was "a special occasion".